Everybody's Fine is a melodrama that tries really, really hard not to be one, hoping the performances from seasoned, recognizable actors will embolden its story of parental catharsis and the consequences of good-intention dishonesty among family. In ways, it almost works: writer/director Kirk Jones' remake of a '90s Italian film grasps the understated strengths of its actors, especially Robert DeNiro, pulling back on the budding emotion present in scenes where a widower father confronts the difference between the expectations he has of his children and the reality about where they've arrived. At its core, however, the story's proclivity towards deceit goes beyond the realm of sensibility and into that of emotional manipulation, the substantial lies told to a seemingly-loved father undermining the point it's trying to make about why such dishonestly is wrong in the first place. The story's focus is the cross-country journeys of retiree Frank Goode (DeNiro), who slaved away for years with PVC-coated phone wires to provide a better, more ambitious life for his children. After the death of his wife roughly eight months prior to the film's events, who was the communicative glue among them all, they became distanced; conversations are sparse and it's a chore to get everyone in the same place, whether it's because of a conflict of schedule or because of a deeper pain about the mother's absence. After a weekend reunion falls through, with every single one of Frank's children declining to come for an organized visit he was looking forward to, he decides to hop on buses and trains -- he can't fly due to health conditions -- and surprise each of his scattered kids with a visit. What he finds is disheartening: each of them isn't as he'd envisioned through their conversations and details relayed through his wife. Frank's travels reveal a man who hasn't been on the road by himself in a long time, if ever following his retirement; he's eager to talk with people about where he's going and about what he used to do for work, and he briskly moves between the sights, hotels and restaurants that he visits. Director Jones captures commonplace visual beauty in these scenes that might fly under the radar of those who aren't as invested in his journey, like the curvature of a metallic avant-garde tunnel and the complex angles of modern architecture. This is the liberating trip of a man reviewing the world outside of his bubble of gardening and grocery shopping post-retirement, the space connecting the places where his children have scattered and developed their lives as a conductor, a dancer, a marketing exec, and an artist. Yet he's not interested in sightseeing, saving all his camera film for his family. He's a man on a mission. Everybody's Fine turns into this downcast, niggling examination of a father discovering that his children aren't as successful as he had been led to believe, both by them and by his wife, as well as a disheartened expression of their perceived disinterest in wanting to spend time with him. Some have concealed minor secrets about their personal lives that partly emerge when he shows up unannounced, such as the integrity of his daughter Amy's (Kate Beckinsale) marriage, while others have been far more dishonest about their personal success -- and they're all harboring a secret about their youngest brother, David, who was nowhere to be found at Frank's first stop. The caliber of duplicity here is more wearisome than emotionally engaging, though; the children go to lengths in order to deceive him, from picking him up in a limousine to lying about performance trips abroad, which seem incongruous with the affection they have for him. 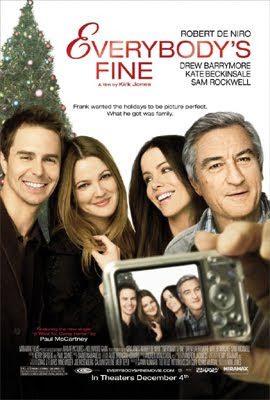 The lies buried underneath these trips -- the domestic turmoil under Amy's roof, the half-truth about his musician son Robert's (Sam Rockwell) career, and the full-on wool-over-the-eyes situation about his dancing daughter, Rosie (Drew Barrymore) -- are given more credence than they deserve in Everybody's Fine due to the actors involved. Kate Beckinsale embodies a rigid, independent marketing woman with an understated coolness and grace, while Sam Rockwell gives Robert the sort of frustration that shows he's content despite falling short of his father's aspirations. Drew Barrymore's flowing, sugary presence suggest the most loving towards Frank, yet also the most deceptive of the bunch. The problem lies in the enormity of the lies underneath their conversations; fine performances make their conversations authentic, to some extent, yet it's hard to ignore just how insistently misleading they become about some rather significant issues. It's a shame, because Robert DeNiro does exceptional work here as Frank Goode. Moderation and emotional nuance loom in his glances and body language over revelatory dinners and chit-chats in concert halls, revealing a father whose controlling hand was one with noble intentions. 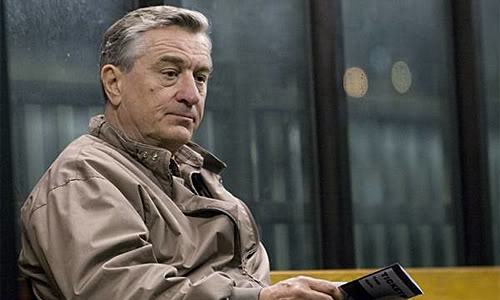 It transforms into one of DeNiro's more gripping, centered characters in quite some time; that slow veer towards a melancholy and tired disposition as he travels from place to place provides an authentic emotional shift, revealing a real grasp on a father who's realizing his faults as a parent and his gaps in presence. His disposition blurs well with scenes where he views the much-younger versions of his children in place of their adult versions, the sad and weathered look in his eyes shifting as he's embraced by their adult iterations. He's not saddled with an over-the-top role here, until it's truly needed -- and the scene where he realizes the full gradient of their deception is stronger because of it. Everybody's Fine desperately works towards making the emotion authentic, for Frank's slow plunge into a downhearted mindset towards a cathartic emotional point, and it makes the audience want nothing more than for the children to come clean and reunite under one roof. Alas, the melodramatic truths about what they're hiding can't skate by on self-aware performances; when a time-sensitive, profound secret finally emerges for Frank to process, it's hard not to feel frustrated with the childrens' ludicrous insistence of keeping it quiet, despite their awareness of his distorted perception of their success. The audience knows that it's coming, punctuated by the frantic conversations between the brothers and sisters played alongside images of Frank's travels, yet it's overwhelmingly difficult to buy that some of these secrets were never mentioned to a father who provided a decent life and who earns at least some of their affection. Everybody isn't fine, and it's either a testament to wrongly-established chemistry in the performances or a fault in the script that something isn't done about their problems sooner.